If you are looking for a machine that is capable of doing more than one type of binding you are in luck. With the Akiles DuoMac series it is possible to choose a machine that will bind two different styles in a single footprint. Choose one of ten different combination units that allow you to produce two different binding styles from the following options: Plastic Combs, 4:1 Pitch Coil, 5:1 Pitch Coil, 3:1 Pitch Wire, and 2:1 Pitch Wire. Or if you are looking for something a little bit heavier duty you can always check out our modular electric punches with interchangeable dies. Expand your horizons and your capabilities with these awesome two in one binding systems. 2 independent punching die sets. Welcome to MyBinding video. 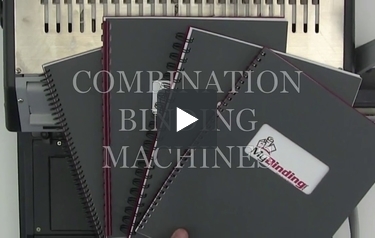 Combination binding machines allow you to do multiple binding styles with one machine, saving you time and money. The machines are built largely in two separate fashions – one with interchangeable parts, such as these punch dies that slide in and slide out so the same machine can do plastic comb binding, spiral coil binding, twin loop wire, you name it. For example, you see here the Versabind by Tamerica. It has a comb closer and opener right on the top, and when you do wire punching and wire binding, you’ll see built-in at the base of the machine is a wire closer. Make your adjustments there, close your wire and you’re all set. By and large, these machines are easy to use. They work well, interchanging the parts is very simple, and, because it’s just one machine, it saves on space. The second approach is all-in-one machines. They have both the punch and the close built right into the machine. Even some of these have interchangeable parts for even more flexibility. As you see here, you’ve got comb binding, punching on the bottom, opening and closing on the top, and, with wire binding, you punch at the top and you close in the bottom. Systems such as this Achilles Dual Mac are heavy duty both for large-volume offices and are industrial in strength. If you have any questions, give us a call, we’ll figure it out, and check out our many demos, reviews and how-to videos.